We asked some of our RiderCoaches about the path that led them to their careers and why they enjoy what they do. Check back often for new posts. At which course do you teach? I teach at Gateway Harley-Davidson in Saint Louis. I am also the Program Manager for the site. I became a RiderCoach in May of 2011. My favorite thing about being a trainer is all of the awesome people you meet, both students, instructors, facilitators, etc. We are all united towards one common goal and that is to further the safety and participation of an organized motorcycling community. I have learned so much from the people I have met and it is that life-long commitment to learning that has made this step in my life one of the most rewarding experiences. 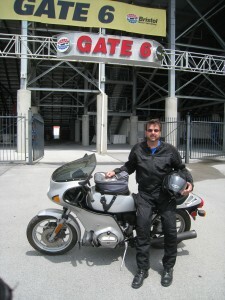 I decided to become a motorcycle trainer, because I could! It’s such an awesome oppotunity to participate in this community and learn more about motorcycles and motorcyclists. I strongly encourage anyone that is considering it to give it some thought. What’s your best tip for practicing motorcycle safety? The best thing you can do to practice motorcycle safety is to ride within your limits. Working at a motorcycle dealership for over five years now, I have heard every horror story under the sun. The common denominator is to push yourself to constantly be vigilant of your own skills and the other factors out on the road. Knowing your motorcycle, your abilities, and the abilities of others is what will make the difference in the long run. Learning those boundaries is a matter of paying attention, practicing and learning from others. 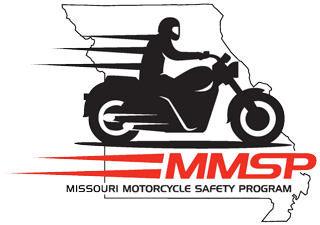 What is your favorite Missouri road to ride and why? My favorite Missouri roads are the ones that are well paved. I think the roads that challenge my own abilities, such as the roads leading from Rt 21 to Bixby, MO are some of my favorites. But any roads with good friends and some awesome food at the end are always the most fun, no matter how twisty. I currently teach at Crowder College in Neosho, Missouri and Cycle Connection Harley-Davidson – Riders Edge in Joplin, Missouri. I just receive my MSF Riders Coach Certificate in 2010 and also received my Riders Edge instructor certificate in the same year. The best part of being a trainer is meeting all the new people from all kinds of different backgrounds, age ranges, and to share my passion of motorcycling with them is truly an honor. I get a lot of enjoyment out of watching the students learn this new skill that is going to open up a whole new book for them in their life story. I actually was approached by the owners of the Harley-Davidson dealer in Joplin. They knew of my passion for motorcycling, and of my background with riding motorcycles, and thought that my personality and experience made me a good candidate to become a coach. I just had to get Mike Davis to see that I could be a good coach as well and to survive RiderCoach Training. I always tell everyone that the secret to riding a motorcycle is so simple, that a caveman can do it. I tell them that if they would simply look to where they want to go, that is where the motorcycle will go. I follow that up with telling them that since I have told them the secret of motorcycling that there class is dismissed (which of course is the first night). My year has been really crazy this year, with the tornado that devastated Joplin on May 22nd, I have not been able to ride a great amount. My favorite Missouri highway this year is when I can get away for a couple of hours, to jump on Hwy 76 and ride to Branson and back. It’s some nice twists in the road but it is covered with shade about half the time. I teach at MCC-Maple Woods site. I started teaching in the Fall of 2001. Before becoming an Instructor I was a Range Aide at Maple Woods. From 2010 to 2014 I was hired to fill the position as Project Associate for Community Education which included coordinating the Motorcycle Safety Program. Seeing student’s progress from never having been on a motorcycle to riding a motorcycle the first day of class. I love to see the smile on a student’s face when they realize they are actually riding and having fun. From the time I was 4 years old I would dream about riding motorcycles; when I was 14 yrs old I bought my first motorcycle with money saved from babysitting. The summer of 1998 I became serious about my riding and purchased my first street bike that was powerful enough to take on long trips. I became a trainer because I am addicted to the feel of riding my motorcycle on a country road and the wind in my face. I want to help others learn to safely ride a motorcycle so they too can enjoy the experience of riding for many years. Riding a motorcycle on a long country road is as close to flying as you can get without leaving the ground. I was an elementary school teacher at the time when I decided to become a Motorcycle Safety Instructor. Teaching is second nature for me, so learning to teach the safety courses was the next logical step in my evolution as an avid motorcyclist. Be mindful of the details and purposeful in your actions. ? My favorite local road is State Highway N which runs for 10 non-stop miles between Platte City and Hwy 152, this is close to where I live so riding this road is something I can do anytime. Now if I were going on a day ride, I’d go to Boonville and turn north on Hwy 5 to Fayette, continue north on Hwy 5 which becomes Hwy 240 as the road turns west to Glasgow. Stop in Glasgow for lunch. Motorcyclists by nature would rather not go back the way they came so for this ride continue west on Hwy 240 to Co Rd P, drop south at this point to Saline City. Jog right through town and quickly turn left on Co Rd AC which continues south to Arrow Rock State Park. After taking a break in the park, jump on Hwy 41 south to Lamine which is a mere 10 miles west of Boonville. This loop is about 65 miles which makes for a pleasant afternoon ride. There is a mixture of flat straight-a-ways and windy curves to keep any rider engaged. Spaced between the small towns are miles and miles of pasture, fields, woods, and river views. I primarily coach at St. Louis Community College at the Forest Park Campus in St. Louis and occasionally fill in at Jefferson County Community College. 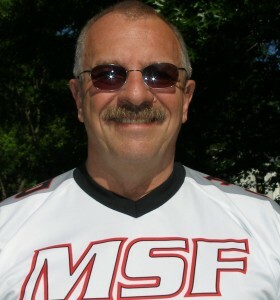 In addition I recently conducted MSF classes for the BMW Motorcycle Owners Association at their national rally. I also conduct regular presentations at local area motorcycle group meetings and events on the value of regular safety training as well as the MSF “Host an Event” curricula such as Group Riding and Season Rider. What is your favorite thing about being a RiderCoach? From a personal standpoint being a RiderCoach has brought my rider skills to a level I may not have achieved without the constant exposure to all aspects of the training. On the professional side, I am always humbled when someone who has taken a class approaches me expressing their appreciation and what the training has done to make them a better and safer rider. It’s those individuals who take what they learn and make it a part of their everyday riding that cements the whole package. Each person attending a training class will take something away that may help them to avoid an undesirable event or crash; just knowing that brings a sense of fulfillment. In 2000 I took a BRC with a friend which also proved to be a very good experience. After taking a class at Forest Park the Site Coordinator asked me if I wanted to be a range aide. Once exposed to the training program on a regular basis I knew what I wanted to do. I always encourage riders to practice the thing they find most difficult until they master it. Low speed maneuver’s is an area many riders have difficulty with and tend to avoid; having the ability and confidence to handle a motorcycle in all riding situations builds confidence. No one is at the top of their game, be it a sport or profession, without proper training and working at it on a regular basis. 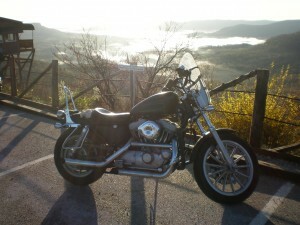 Motorcycling is no different; if you want to be good you need to ride! And most importantly “riding your own ride” and “riding within your limits”! My favorite road is the one I have never been on and when the day is done I turn on my GPS and select Home. Even if you live in an urban area it is a relatively short trip to some great roads regardless of the type of riding you’re in the mood for. I mostly teach at Forest Park Community College but have taught at Jefferson County Community College and at the St. Charles City Parks site. I have been an Instructor/RiderCoach since 1997. My favorite thing about being a trainer is seeing the light bulb go on when someone learns a new skill. I decided to become a trainer because it is a combination of three interests of mine: helping people, safety, and riding motorcycles. 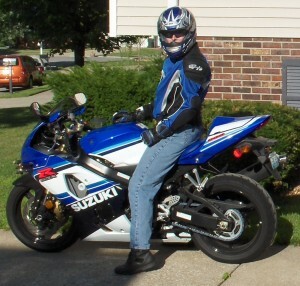 My best tip for practicing motorcycle safety is paying attention and wearing all the gear all the time. My favorite Missouri road to ride is anything curvy because I love cornering! 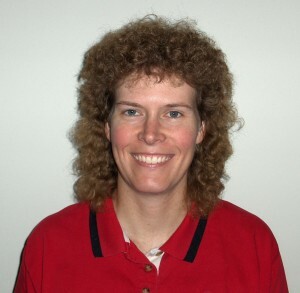 I am the site coordinator at Maple Woods Community College in Kansas City. I also teach at Maple Woods Community College in Kansas City, and have taught at Ozarks Technical College in Springfield. I have been a RiderCoach since 2010 and I hit the ground running, winning the MMSP Rookie RiderCoach of the Year in 2010, and earned my IME and ARC/ST certifications in 2011. My favorite thing about being a trainer is seeing a student struggling at first finally “get it”. It’s like the light bulb goes on in their head, and they finally realize why we are pushing the exercises in the MSF program. For some, their riding suddenly improves like the flick of a switch. Its the most rewarding part of being a coach. I was very discouraged by the lack of motorcycle skills and safety I witnessed when attending rallies or charity rides. It seemed like every year there were several serious accidents whenever groups got together to ride in large numbers. 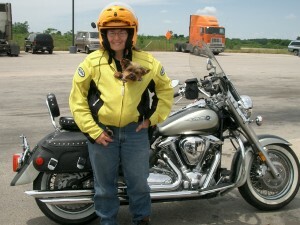 My friend Anne Saults from Worth Harley Davidson told me about the process to become a RiderCoach in Missouri. She deserves the credit for getting me to the “front door” of the program. Even though I live in Kansas, I like the structure and support that the MMSP provides. It makes for a better experience for the coaches and students. Whether you are a RiderCoach or just a rider, take as much continuing training as possible. Become a safety junkie. Read books by the experts, watch videos, and get out and RIDE whenever possible. I think a good coach should log at least 10,000 miles a year to stay sharp and continue to become a better rider. 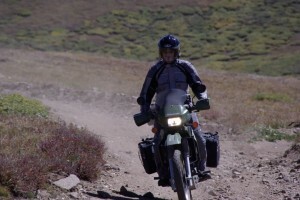 Ride outside of your normal comfort zone, such as at a track day or off-road adventure. Keep expanding your horizons!